While cleaning out some old photo folders I stumbled across a pair of images that show an effect called the Fata Morgana, technically known as a superior mirage. Neither of the photos is of very good quality, and they were taken at different exposures and times for different purposes, but when I had them open side-by-side on my desktop I noticed something really amazing. Flip back and forth between the two slides above and you’ll see it too. 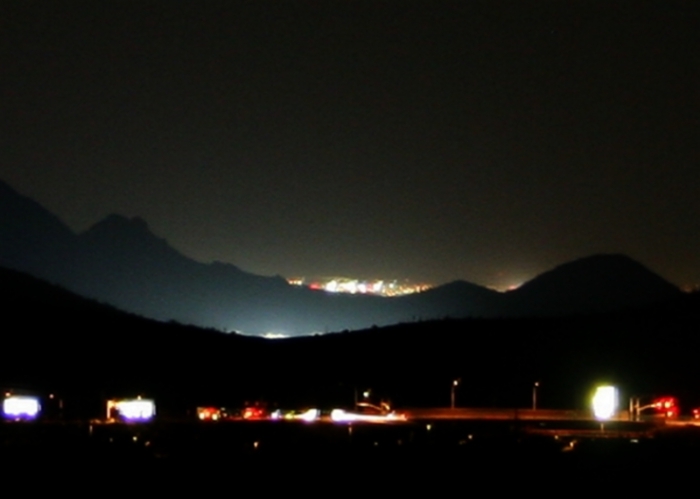 The images show a view of Phoenix to the southwest of my location on two meteorologically distinct days. Both photos were taken through a 200 mm telephoto lens. Notice how part of the city skyline barely visible in the first image appears to rise over the distant (80 km) range of mountains. 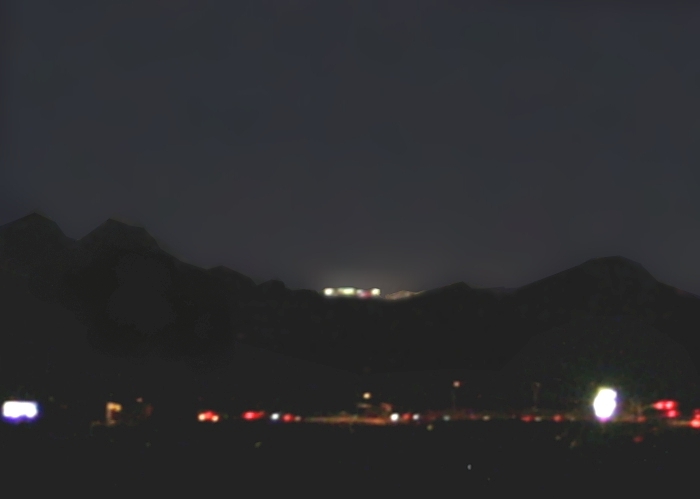 The dome of white light that appears in the second image is Phoenix Stadium, which had it’s lights on that evening. But it’s the “rising city” that I want to talk about. A related phenomenon, the inferior mirage, is much more common. See my Sep 26, 2011 post about highway mirages. In that case, the temperature profile of the air cause light rays to bend upward. To produce a Fata Morgana the light rays must bend downward as shown below. The human eye-brain system assumes objects are located in the direction their light rays are arriving from, so we see a mirage of the distant skyline “floating” in the sky. Depending on atmospheric conditions there can be multiple light rays from different points on the object converging at your eye. As a result the mirage appears blurry and distorted, stretched out vertically, tipped toward or away from you, or even inverted. In some rare cases, multiple copies of the same mirage appear in a vertical stack. The graphic above shows the ray geometry creating the relatively simple mirage seen in my photos. Notes on this graphic: The atmospheric temperature change is not abrupt as the graphic might seem to indicate — it’s a gradual transition over 1000s of meters. This is why the light rays continue to curve smoothly until they reach the more-stable, well-mixed air usually found in my area (mountain foothills). 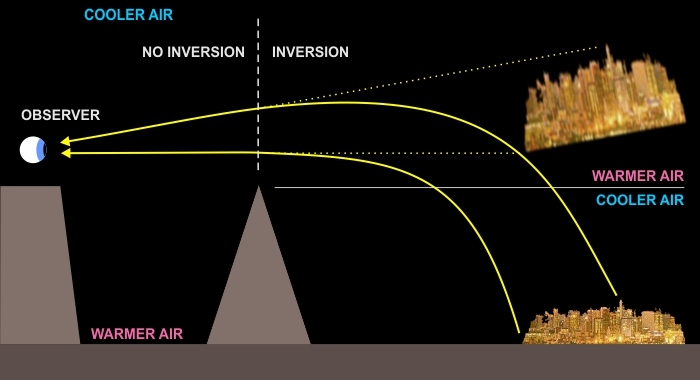 Nor does the graphic show the gentle upward curvature of light rays in a normally stratified atmosphere. Finally, curvature of the light rays is exaggerated for effect, and only the two rays delimiting the mirage are shown. All other rays from the skyline to your eye take intermediate paths. You can see other examples of superior mirages on the Atmospheric Optics website, or just search for “Fata Morgana” in Google Images — you’ll notice the effect is more common over water, where the required temperature profile (warmer air above colder air) is the norm. You’ll also notice the vast majority of images show the effect during daylight. This is not because the effect is any more common during the day — daylight photos are just easier to shoot.